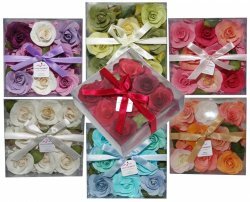 Eight beautifully crafted and scented handmade roses with petals in a clear giftbox. Red - Rose, Orange - Peach, Green - Lily, Pink - Orchid, Purple - Lavender, Blue - Ocean, Cream - Vanilla. EXTRA DISCOUNTS FOR ONE OR MORE CARTONS OF 24 ASSORTED.